Last month Spennymoor Leisure Centre in County Durham hosted a Dementia Friendly Open Day. It aimed to raise awareness of their new dementia friendly swimming sessions and bring together members of the community. Find out more about Spennymoor Leisure Centre on the Durham County Council website. Durham County Council and the Alzheimer’s Society teamed up to deliver the event together. It was aimed at people living with dementia, their carers, friends and family. 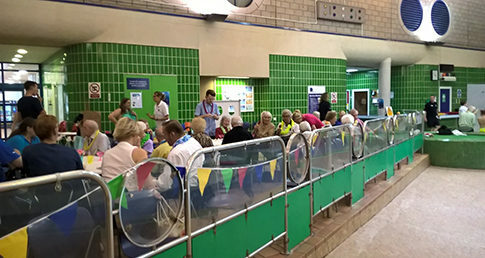 The event promoted the launch of dementia friendly swimming sessions at the leisure centre. There were also other activities happening there too, like the Alzheimer’s Society Games for the Brain group. These included a variety of indoor sports and games such as table tennis for the more active and board games for those who wanted to stay seated. Over 30 people attended the event, which also included a pool party with inflatables and drinks and ice creams served by the pool. 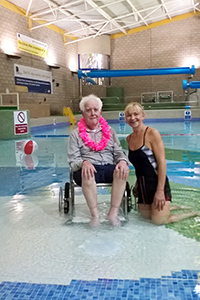 Deborah Breen, Dementia lead at Durham County Council, said: “We have been offering dementia friendly swimming sessions at Chester-le-Street since 2015. But we have recently introduced them in other centres, including Spennymoor. “As the Alzheimer’s Society were already running a Games for the Brain in the Centre, we thought it was an ideal opportunity to team up and promote both activities. “The pool party worked really well. We wanted to create a feeling of being on holiday. This meant those who didn’t want to swim could still enjoy the experience. Dementia friendly swimming sessions take place one a week at Spennymoor Leisure Centre, each Monday from 2:30-3:30pm. For more information about the sessions, please email: leisure-spennymoor@durham.gov.uk, or call 03000 261 161.